A tree is known by its leaves; but without the roots and main trunk, the leaves would neither bud nor thrive. The leaves identify the tree, but the tree gives life to the leaves. Branches Band, a Milwaukee- based music group, uses their love for music to identify the Savior of the world - Jesus! From ancient hymns to modern songs, from guitars and piano to vocal harmonies, the Truth of Godʼs love and grace is at the root of the Branches Band ministry. Rachel Braun (vocals, percussion, and piano), Andy Braun (guitar, vocals, and harmonica), and Jeremy Bakken (piano, bass, and vocals) travel all over the United States and Canada with their repertoire including hundreds hymns and songs. Branches Band serves congregations by offering Christian concerts, assisting with worship, and developing music resources for todayʼs church leaders and worship teams. For more information, scheduling, albums and other resources, visit branchesband.com. To learn more about each band member click here to read their individual bios. Listen below to some of the Christmas music featured on their albums! Andy and Rachel also serve their Milwaukee community by playing for a variety of public and private events. Their acoustic duo is aptly named “Andy & Rachel” www.andybraun.com. Branches Band will be playing in Wisconsin for the entire month of December (and into January)! There are plenty of opportunities for Advent/Christmas worship services and concerts all over the state. Click here to view their schedule. If you would like to purchase any of their CDs, Branches Band is offering FREE SHIPPING on ALL CDs for the rest of the month of December! Shop here! Congratulations David P! 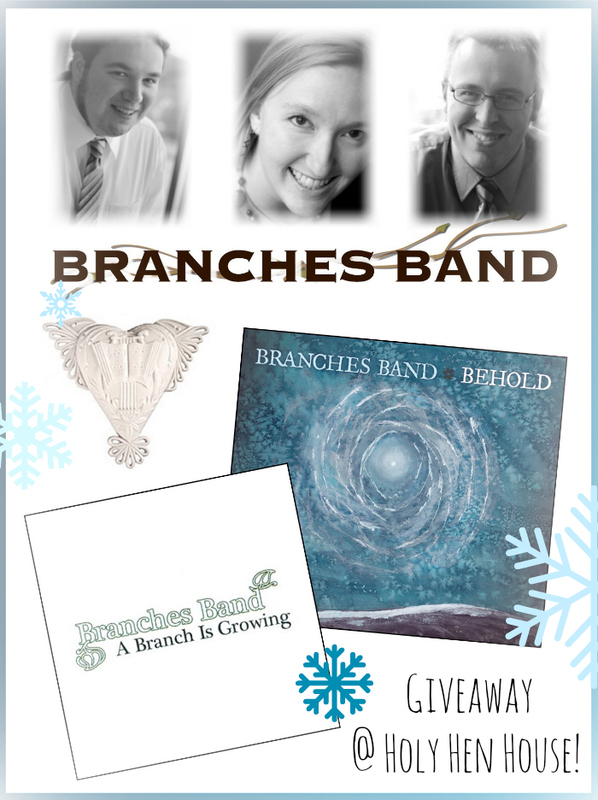 You won the Branches Band Christmas gift set! This is the fourth and final Christmas giveaway. We love Branches Band's name and it's significant meaning based from imagery found in God's Word. What bible passage is especially meaningful to you? Please share!